Quickies : What we have now become! steadyaku47 comment : From Berahim Berok to this….this is what is becoming of our country today…look carefully at the following two images and ask yourself this : How can I as a Malay not be embarrass at the antics of these Malays who are rubbing shoulders with other Malay leaders from Umno? 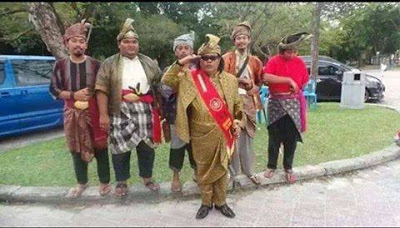 And if you are not a Malay do you not snigger and shake your head at the idiocy of these Malays first dressed in some military regalia of soldiers from God knows what tin pot alley country from the depths of Africa and then dressed as Malay warriors! Bugis warriors maybe? Yes that is what our country have now descended into….farce and comedy with jokers like them taking center stage….and the pity of it all…..these Jokers really think that they are the very people our country crave and need…and our leaders in government tolerate them and allow them license to do the nonsense that they do….but then what do you expect when the prime minister himself is a clown! God help us all! Benny Hill would have use of them in his show! By Hussein Abdul Hamid|2018-07-14T06:53:53+08:00November 8th, 2015|Categories: Uncategorized|Tags: Malays, stupidity|Comments Off on Quickies : What we have now become!